Name. The user's name as per the registration details. Organization. Optional organisation information as per the registration details. Registration Code. The licence code as supplied by Eastgate. 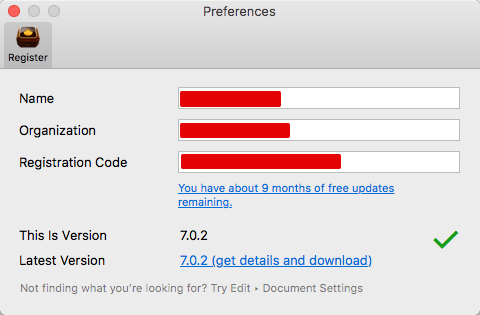 Beneath is shown the number of months remaining of access to free updates. This is Version. The version of Tinderbox currently being used. Latest Version. The latest public release of Tinderbox. Tick/Cross. The tick symbol indicates the supplied registration code has been successfully applied. A text prompt indicates where to find Document Settings (v.7.0.2).